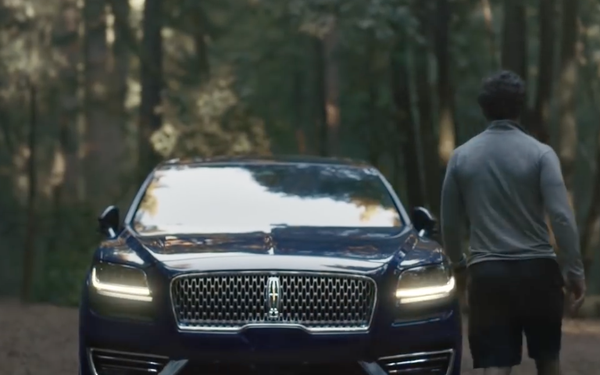 Matthew McConaughey is back in a new spot for the Lincoln Motor Co., and this time he’s running through a redwood forest. The actor is a frequent star of TV spots for the Ford Motor Co. luxury division. After running for a bit, McConaughey looks down at his smartwatch to check his stats. When he gets in his Lincoln after the run and turns on the ignition, the car’s information system presents him with a range of info about the vehicle systems. The 2019 Lincoln Nautilus includes Lincoln Co-Pilot360 Technology, a suite of available driver assist technologies including a system that helps the driver stay in the intended lane. Cross-traffic alert gives drivers another perspective when backing out of a parking space. The 60-second spot, “Morning Run,” is on YouTube, with a shorter version now running nationally to announce the Lincoln Spring sales event. The spot is an extension of the billiards-themed campaign that broke in December. A Lincoln Navigator spot featuring Serena Williams debuted during the Grammys in February. The haunting music in "Morning Run" is “A1” by Ólafur Arnalds and Nils Frahm.